Whether educating the public or engaging opponents, ExxonMobil's VP of public and government affairs brings a lot of energy to every discussion. Not only does Ken Cohen work in the oil and gas sector, one of the largest, most complex, and vital global industries, he is VP of public and government affairs at ExxonMobil, the biggest player in the market and the largest company in the world. ExxonMobil reported 2011 global earnings of slightly more than $41 billion. With those numbers the company was able to regain the top spot on the Fortune 500 list, pushing Walmart into second place. Earnings for the first nine months of 2012 were $34.9 billion, up 10% compared to the same period in 2011. 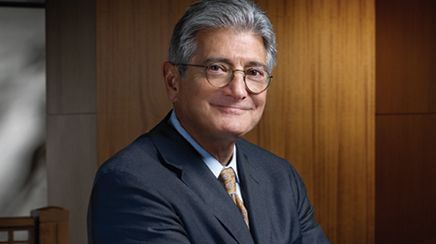 Cohen began his career at Exxon in 1977 as a lawyer working his way up on the legal side until 1999, when the company acquired Mobil, and he was asked to build and run a combined public affairs group. Today, Cohen leads a global team of 460 full-time staffers who handle all external facing communications, including media relations, government affairs, and CSR, for the 80,000-employee company and is chairman of the ExxonMobil Foundation. The only exception is investor relations, which is handled by a different team. Around the time of the acquisition, Exxon-Mobil invested resources on research with constituencies including customers and media to define effective ways to handle external challenges in areas such as corporate reputation. That information spurred the company to develop an integrated department that has evolved during the last decade. "If you were to go to a big public and government affairs firm they would have their best people ready and able to jump in and solve the problem," says Cohen. "That is the integrated approach we take." The research also flagged up the growing power of social media, resulting in a much more proactive approach for the company on YouTube, Twitter, and Facebook and more engagement of constituencies by senior management, including Cohen, via blogs. Social media outreach will increase going forward because it allows a conversation. "You can ask me questions, I can respond," adds Cohen, as opposed to having the story interpreted by journalists via traditional media. "The biggest challenge ExxonMobil and the industry face is that people don't know a lot about us. It's very frustrating. The extent of America's knowledge is when they pull up at the pump or plug something into the wall," explains Cohen. "We have to lay part of the blame at the doorstep of the industry. We have not done a very good job historically of explaining what we do." And doing that requires clear and direct communication because even explaining the cost of gasoline, let alone the process behind the newer technologies of hydraulic fracturing, can be complex. A lot of discussion now is centered on natural gas production. "North America has discovered this great bounty of natural gas. If you asked me six or seven years ago 'Is this going to change the landscape?' I would have questioned it," adds Cohen. "Today I sit here and say it's a game changer. Now, we are trying to explain the process by which we produce it and then the environmental benefits and issues that need to be man- aged from the production." As with many communications efforts at ExxonMobil, the arc of that explanation must engage and educate the public in a story that began more than a decade ago. The gasoline a consumer buys today is the result of significant investment at least 10 years ago - five years of planning, five years in construction. Job growth has been a powerful messaging point. In an economic downturn, one of the few bright spots in the US has been the oil and gas industry. "ExxonMobil contributed $72 billion to the US economy through activities including taxes, salaries, returns to our investors, and payments to other businesses and industries," notes Cohen. "Some may feel there are political reasons for singling out the industry for punishment, but there aren't good economic ones. By seeking to remove standard tax provisions available to all other manufacturers and producers, the policy being suggested by the president and others would undermine one of the few sectors investing in America and creating jobs." The quality of math and science education in the US is an important issue for ExxonMobil and Ken Cohen, VP of public and government affairs. "We are a company of scientists and engineers - 18,000 employees are scientists," explains Cohen. "The present and future of ExxonMobil is totally tied to the scientific and technology capabilities of our people." In response ExxonMobil has committed $125 million to a national initiative to improve math and science education in the US. "Ken is an invaluable member of our board," explains Tom Luce, chairman and founding CEO of The National Math and Science Initiative. "He is strategic, focused, and results oriented and always seeking other corporate and foundation partners for our national effort." Cohen, soft-spoken, but clearly passionate and inspired by the changes he sees in the industry, is based at corporate headquarters in Dallas and reports to Michael Dolan, SVP, ExxonMobil. "The global energy industry is critical to economic progress and operates in a complex geopolitical environment; and Exxon- Mobil is an industry leader with a good story to tell," says Dolan. "Ken and his team understand that story and the world we are operating in. They help us cut through the noise with the right tools, tone, and messages to support our business objectives." An important tool on the education front is the annual Outlook for Energy report the company generates that includes information from about 100 countries. It is built from the ground up every year and is the basis for ExxonMobil's business planning. The comprehensive outlook includes an examination of all energy sources, consumption levels, future demand, and even drills down to what research is being done by auto- makers. During the last five years there has been a much broader dissemination of the report. ExxonMobil launched the 2013 version at a press conference in November in part to be more open about its research, but also to create a starting point for dialogue with policymakers and consumers. "One of the challenges is that we have a very vocal and well-funded group of adversaries. Their objective is to get up every day and criticize what we do and convince policymakers that action is needed to restrict the operations of firms such as Exxon-Mobil," says Cohen. "We have to find the right tone and way of engaging someone who has an entirely different point of view," he adds. "We should all at least make an effort to understand what the facts are so we have some common understanding of what the problem is." The company is looking at getting into areas in the Middle East previously only open to government-owned entities; taking a bigger position in Argentina on natural gas produced through new technologies; and looking to expand in Africa. Cohen says the hottest energy market is in North America, but "85% of potential oil- and gas-producing areas are off limits and in federal hands because of political reasons. "Areas of interest include the outer continental shelf along the western part of the US, the eastern Gulf of Mexico, and northern part of Alaska. "We have active discussions about opening areas up for exploration and development," he adds. CSR can play a big role in those discussions both here and abroad. ExxonMobil is working with partners including the World Health Organization and Harvard to eradicate malaria in Africa, as well as funding programs that create job opportunities for women in areas such as the Middle East, and has made a commitment to fund education initiatives in the US (see sidebar). Last year employees donated 729,000 hours of community service and the foundation gave $278 million in contributions. "We hope people realize that when we are operating in a community we are a good neighbor and a philanthropic force," explains Cohen.